Cassan Pulaski, MPH,DVM, the NCVP-Merck Resident in Veterinary Parasitology, grew up in Mandeville, Louisiana, just outside New Orleans. She earned a B.S. in Biology and a B.A. in Psychology from the Sally McDonnell Barksdale Honors College at the University of Mississippi in 2008. She then completed her MPH and DVM degrees at Louisiana State University in 2012 and 2013, respectively. 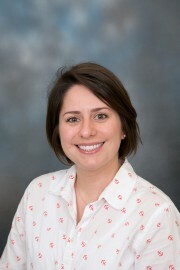 Following graduation from veterinary school, she began a PhD program at LSU under the guidance of Dr. Jack Malone in the department of Pathobiological Sciences, and in January of 2015, she officially initiated her NCVP residency program in clinical veterinary parasitology. Dr. Pulaski’s research focuses on macrocyclic lactone resistance in Dirofilaria immitis, including the epidemiology and transmission dynamics of canine heartworm disease in the Lower Mississippi Delta region. She currently assists with teaching of both the veterinary Year II parasitology course and the Year IV clinical rotation, as well as working as a diagnostician in the parasitology section of the Louisiana Animal Disease Diagnostic Laboratory. Dr. Pulaski spends her Saturdays practicing at Garden District Animal Hospital, a local small animal general practice in Baton Rouge, and in her free time, she enjoys traveling and attending food and music events with her husband, Justin, and volunteering at vegetation planting days with non-profit groups aimed at restoring the Louisiana coastline. She is a self-proclaimed 'cat person' and although her husband is highly allergic, they have successfully survived their first 2 years of marriage along with their two cats, Fugee and Parchman.